I just wanted to write a short post today reacting to watching the final Michael Scott episode from the television series The Office. I have to admit that I was a big fan of the show early on, thought that the series hit it's peak around Seasons four and five (with the best episode of all time, in my opinion, being "Stress Relief" where Dwight Schrute does the fake fire drill) and kind of tapered off from there (especially with the Jim-Pam romance) and became unwatchable when that company that makes printers bought Dunder-Mifflin. However, I was curious to see the final episode with Michael,. Would the series actually make the exit funny and memorable, or would they produce a sappy, emotional piece of drivel? As expected, almost the entire episode was devoted to an insipid and drawn out farewell between Michael and the rest of the coworkers in the office. A minute at the end of the episode is something I could excuse. Having nearly the entire episode devoted to this sappiness, however, was downright aggravating. One of the charms of The Office back when it originally started was that it involved a bunch of difficult people stuck together in an office and trying to find ways to avoid killing each other. 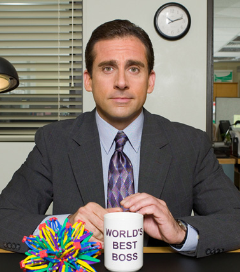 Even after that element died out -- probably because the writers made the mistake of falling in love with their characters -- the sheer talent and charisma of Steve Carrell carried the series for a little while. But, to me, this silly cry-fest that the audience was subjected to tonight is evidence that the series should have ended a long time ago. If the series has any chance of surviving a few more seasons, the writers need to take a serious step back and have the characters start disliking each other again. When I tune in, I want to see tension, sarcasm, and the discomfort that comes with people saying and doing things in situations that mimic those in real life. I don't want to see hugging.